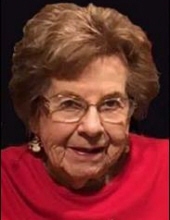 Betty Ann Tolley, age 83, of Reynoldsburg, OH, formerly of Ripley, WV, passed away Thursday, January 24, 2019 at Mt. Carmel East Hospital. She was born in coal country in Mammoth, WV on February 22, 1935 to the late James and Ada Poling. In West Virginia, she was a long-time Avon representative for many years. She enjoyed clogging with her husband at the live stock market in Fairplain, WV. They also loved ramp-hunting trips and dug them every spring in the mountains of West Virginia. Enjoyed the Fourth of July festivities in Ripley and the Arts and Carfts Fair out at Cedar Lakes fairgrounds. In Ohio, she was an active member of the Reynoldsburg Historical Society. Loved a good thrift store find and every Wednesday looked forward to her weekly lotto scratch off ticket. She would have many garage sales a year—mainly in the summer and fall. Looked forward to starting a good conversation, for she never knew a stranger. Her friends and neighbors meant the world to her. She is survived by her son John D. Tolley (Bonnie) of Pickerington, Ohio, brother Paul Poling (Vivian) of Ripley, WV, grandchildren Zachary Tolley of Columbus, OH, Kyndall Smith (Albert), great grandchildren Jayden and Emerson Smith of Canal Winchester, OH and loved by many nieces and nephews. In addition to her parents, she is preceded in death by her loving husband John F. Tolley, brothers Noel, Howard and sister Francis Poling. Also, her beloved terrier Annie. She went peacefully on her own terms and those who knew her know she wouldn’t have it any other way. The family has requested bright colors to be worn in celebration of her life. Family and friends may call Monday January 28, 2019 from 2-4pm and 6-9pm at the Waybright Funeral Home in Ripley, WV. Funeral services are to be held Tuesday, January 29 at 11am at Waybright Funeral Home. Burial at Pine Hill Cemetery, Ripley. In lieu of flowers, donations can be made in Columbus, OH to the Reynoldsburg Historical Society- 1485 Jackson Street, Reynoldsburg, OH 43068. In West Virginia to the Jackson County Animal Shelter- 86 County Farm Road, Cottageville, WV 25239. To plant a tree in memory of Betty Ann Tolley, please visit our Tribute Store. "Email Address" would like to share the life celebration of Betty Ann Tolley. Click on the "link" to go to share a favorite memory or leave a condolence message for the family.